Getting stuck in anger is one of the worst places to be. It’s like being boxed into a corner with no where to turn. You are full of emotion but have no idea how to get rid of it in a constructive way. 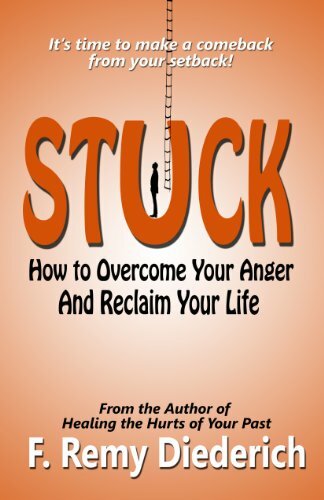 If that’s where you find yourself today, then STUCK may be the book to help you get unstuck. F. Remy Diederich’s writing is rich in biblical thought and counsel, but not simplistic in its application, or blind to the realities of relational breakdowns. Issues of anger management and forgiveness are carefully looked at from a biblical perspective. Remy also includes a special section on how to forgive yourself. While encouraging reconciliation, Remy is also aware that reconciliation and forgiveness do not always go together. You can forgive without reconciling. In a practical, “how-to” approach, Remy walks you through the minefield of broken relationships and forgiveness. What will you learn from STUCK? • A full understanding of anger and what makes you angry. • Seven reasons why those closest to you often tick you off. • How to take control of your anger and let it work for you. • Seven reasons you stay stuck in broken relationships. • Why grieving is so important after a significant loss. • A practical and biblical guide on how to forgive others. • How to help others forgive you and reconcile. • How to forgive yourself. • How to move on from your past and reclaim your life. Each chapter closes with questions to spur self reflection or small group discussion. Is it Time for You to Get Un-STUCK from Anger? If you have been considering marriage counseling or any kind of Christian counseling, then STUCK might be a good first step to move in that direction. It could be just the thing you need to help you get unstuck and move on with your life. Note: The three books in the Overcoming Series can be read in any order. They each stand alone, although when read together, complement each other, helping the reader to find freedom from a variety of emotional issues.